We report the complete nucleotide sequence of plasmid pMR68, isolated from Pseudomonas strain K-62, two plasmids contribute to broad-spectrum mercury resistance and that the mer operon from one of them (pMR26) has been previously characterized. The plasmid was 71,020 bp in length and contained 75 coding regions. Three mer gene clusters were identified. The first comprised merR-orf4-orf5-merT1-merP1-merF-merA-merB1, which confers bacterial resistance to mercuric ions and organomercury. The second and third clusters comprised merT2-merP2, which encodes a mercury transport system, and merB2, which encodes an organomercurial lyase, respectively. The deduced amino acid sequences for the proteins encoded by each of the mer genes identified in pMR68 bore greater similarity to sequences from Methylobacterium extorquens AM1 than to those from pMR26, a second mercury-resistance plasmid from Pseudomonas strain K-62. Escherichia coli cells carrying pMKY12 (containing merR-orf4-orf5-merT1-merP1-merF-merA-merB1 cloned from pMR68) and cells carrying pMRA114 (containing merR-merT-merP-merA-merG-merB1 cloned from plasmid pMR26) were more resistant to, and volatilized more, mercury from mercuric ions and phenylmercury than the control cells. The present results, together with our earlier findings, indicate that the high phenylmercury resistance noted for Pseudomonas strain K-62 seems to be achieved by multiple genes, particularly by the multiple merB encoding organomercurial lyase and one merG encoding cellular permeability to phenylmercury. The novel mer gene identified in pMR68 may help us to design new strategies aimed at the bioremediation of mercurials. Pseudomonas strain K-62, a bacterial strain isolated from phenylmercury-polluted soil, is about 1,000 times more resistant to phenylmercury than sensitive strains of Escherichia coli (Tonomura et al. 1968). A study performed about 40 years ago showed that the biochemical mechanism underlying this mercurial resistance is based on the enzymatic degradation of organomercurials and the subsequent reduction of the resulting mercuric ions to the less toxic and more volatile metallic mercury (Tonomura et al. 1968). Two separate organomercurial lyases, designated S-1 and S-2, each showing somewhat different physical properties and substrate specificities, are thought to be responsible for the resistance of P. K-62 to phenylmercury (Tezuka and Tonomura 1976;Tezuka and Tonomura 1978). The organomercurial resistance of this soil strain is encoded by two plasmids, pMR26 and pMR68 (Kiyono et al. 1995b). In addition, pMR26 contains two mer operons that map about 1 kb apart (Kiyono et al. 1997). One comprises merR- o/p-merT-merP-merA-merG-merB1. The other is a defective mer operon comprising merR-o/p-merB2-merD (Kiyono and Pan-Hou 1999a). Studies suggest that merR is a regulatory gene that both negatively and positively controls the transcription of merTPABD (Ansari et al. 1995;Brown et al. 2003), whereas MerD is a transcriptional co-regulator (Hobman and Brown 1997;Kiyono et al. 1995a;Lund and Brown 1987). MerT, merP, merA, and merB encode a membrane Hg2+-transport protein (Hobman and Brown 1997;Kiyono et al. 1995a;Lund and Brown 1987), a periplasmic Hg2+-binding protein (Hobman and Brown 1997;Kiyono et al. 1995a;Kiyono et al. 2000;Lund and Brown 1987), a mercuric reductase (Hobman and Brown 1997; Schiering et al. 1991; Silver and Phung 1996), and a organomercurial lyase (Griffin et al. 1987;Lafrance-Vanasse et al. 2009;Miller 1999), respectively. merG, identified in pMR26, is a newly-identified mer-gene involved in phenylmercury resistance, which is thought to act by reducing cell permeability to phenylmercury (Kiyono and Pan-Hou 1999b). Taken together, these findings suggest that the high resistance to phenylmercury shown by P. K-62 is mediated by the two functional organomercurial lyase enzymes encoded by pMR26 merB1 and merB2 (Kiyono et al. 1995b; Kiyono and Pan-Hou 1999a), by changes in cellular permeability to phenylmercury mediated by merG (Kiyono and Pan-Hou 1999b), and by an presumptive mer operon located on plasmid pMR68 (Kiyono et al. 1995b) However, no mercurial-resistance loci have been identified in pMR68; indeed, a previous study shows that removal of pMR26 from strain K-62 does not alter its mercurial-resistant phenotype nor prevent it from volatilizing Hg2+ and organomercurials (Kiyono et al. 1995b). 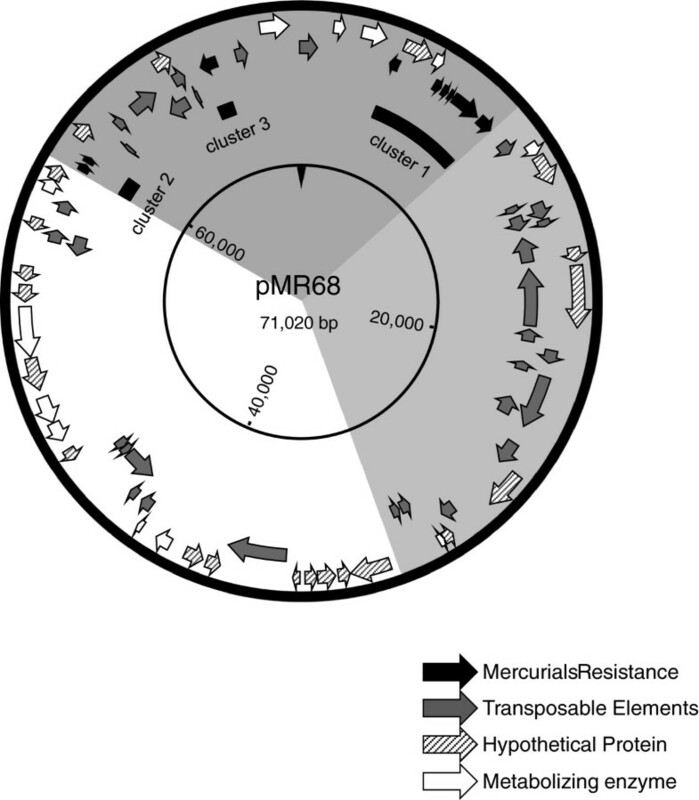 To fully explain the high resistance to phenylmercury observed in this strain of soil bacteria, it is essential to understand the mer genes expressed by pMR68. The aim of the present study was to completely identify the mercury resistance genes of plasmid pMR68 isolated from strain K-62. The mer genes encoded by pMR68 were then cloned and analyzed. P. strain K-62, isolated from phenylmercury-polluted soil in Japan (Tonomura et al. 1968) and deposited in a culture collection belonging to the WDCM56, was kindly supplied by Dr. K. Tonomura and grown in nutrient broth as previously described (Tezuka and Tonomura 1976) (see Table 1). E. coli XL1-Blue was grown at 37°C in Luria-Bertani (LB) medium. Antibiotics or mercuric chloride were added to the medium at the following concentrations when appropriate: ampicillin, 100 μg/ml (E. coli); mercuric chloride, 40 μg/ml. Six plasmids (8.5–82 kb) (Kiyono et al. 1995b) were purified from strain K-62 grown in nutrient broth for 3 days at 30°C according to the method of Sasakawa et al. (Sasakawa et al. 1986). The purified plasmids were loaded into the wells of a 0.7% low-melting temperature agarose gel (SeaPlaque GTG agarose, Lonza Rockland, Inc., Rockland, ME) and electrophoresed in 0.5 × TBE (45 mM Tris HCl, 45 mM boric acid, 1 mM EDTA) in a contour clamped homogeneous electric field (CHEF) DRII device (Bio-Rad Laboratories, Hercules, CA) with the pulse-time ramped from 10 to 60 s (6 V/cm) for 16 h at 14°C. The gels were then stained with ethidium bromide. The band corresponding to the pMR68 plasmid was excised and equilibrated in small amount of buffer (10 mM Tris HCl pH 7.5, 0.25 mM EDTA, 100 mM NaCl). The agarose was melted at 68°C and digested with ß-agarase (New England Biolabs, Hertfordshire, England). The pMR68 plasmid was then concentrated by ethanol precipitation. Purified pMR68 plasmid DNA (15 μg) was sequenced by Eurofins MWG Operon (Ebersberg, Germany) using a Genome Sequencer FLX Titanium system (Roche, Basel, Switzerland). Shotgun sequencing was then performed on the range of one region of a 16-region picotiter plate, resulting in 33,964 reads with an average length of 340 bp. The sequences were assembled using Celera Assembler Version 5.3, generating 18 contigs of at least 1,000 bp in length, some of which were high coverage (>100-fold). Connections between these contigs and adjacent contigs with similarly high coverage were identified by looking for sequencing reads that were split between contigs by the assembly software. Using this process, a chain of seven contigs was assembled into a 71,020 bp sequence. The joins between the seven contigs were checked by PCR using the following primer pairs: 1U-68 kb-15850 and 8 L-68 kb-16600; 2U-68 kb-18520 and 9 L-68 kb-19216; 3U-68 kb-19421 and 10 L-68 kb-20259; 4U-68 kb-38451 and 11 L-68 kb-39477; 5U-68 kb-42220 and 12 L-68 kb-43396; 6U-68 kb-67929 and 13 L-68 kb-68480; and 7U-68 kb-70484 and 14 L-68 kb-457 (see Additional file 1: Table S1). After the complete nucleotide sequence of pMR68 was obtained, potential open reading frames (ORFs) was searched using the program of genetic information processing software (Genetyx corporation, Tokyo, Japan) and using protein BLAST (http://blast.ncbi.nlm.nih.gov/Blast.cgi) to confirm the results. Conserved domains were identified searching for Clusters of Orthologous Groups of proteins (COGs) in the NCBI data base. The molecular weights of the encoded proteins were determined by ProtParam (Swiss Institute of Bioinformatics; http://www.expasy.ch/tools/protparam.html). The annotated sequence of pMR68 was deposited in the NCBI database under Accession No. NC019309. Plasmid pMKY12 was constructed as follows: Plasmid pMR68 (accession no. NC019309) was used as the template for PCR amplification (PrimeSTAR GXL DNA polymerase, Takara Bio, Inc., Otsu, Japan) of a 10.3 kb fragment containing the merR- o/p-ofr4-orf5-merT1-merP1-merF-merA-merB1 genes. The primers used were 16U-68 kb-2393 and 21 L-68 kb-9566 (Additional file 1: Table S1). After blunting and 5'-phosphorylation of the DNA fragment using a Mighty Cloning Kit (Blunt End) (Takara Bio, Inc., Otsu, Japan), the DNA fragment was cloned into the blunt-ended (Hin c II) vector, pUC118 (Vieira and Messing 1987). Plasmid pMRA114 was constructed as follows: Plasmid pMRA17, containing a 6.6 kb merR- o/p-merT-merP-merA-merG-merB1 fragment from pMR26 (accession no. D83080), which contains restriction sites for Sac I, was used as the starting material. After digestion with Sac I, the 6.6 kb fragment was cloned into the corresponding sites in pUC118. The integrity of all cloned fragments was confirmed by sequencing. The resistance of E. coli XL1-Blue carrying pUC118 (control vector), pMRA114, or pMKY12 to HgCl2 or C6H5HgOCOCH3 was determined in liquid medium. E. coli cells carrying the control or recombinant plasmids were grown overnight in LB medium at 37°C. Cells were harvested and suspended in LB medium (1.6 × 107 cells/200 μL/well) containing HgCl2 or C6H5HgOCOCH3 at various concentrations. After incubation at 37°C for 16 h, the absorbance of each culture was read at A600 to measure cell growth. The mercury volatilization assay was performed as follows: E. coli cells carrying the control or recombinant plasmids were grown to mid-exponential phase and then suspended in LB medium containing 50 μM HgCl2 or 5 μM C6H5HgOCOCH3. After incubating at 37°C for 16 h, the samples were digested with concentrated nitric acid for 2 h at 90°C and the amount of mercury remaining in the medium was determined by flameless cold-vapour atomic adsorption spectrometry using an atomic mercury analyser (HG-310; Hiranuma, Japan). The complete nucleotide sequence of plasmid pMR68 was assembled into a circular DNA sequence comprising 71,020 bp, with an overall G + C content of 64.5%. The sequence showed that pMR68 was 3 kb larger than previously calculated on the basis of agarose gel electrophoresis (Kiyono et al. 1995b). Figure 1 shows a detailed genetic map of pMR68. The predicted coding regions showed a particular genetic organization, highlighting two well-defined regions that corresponded to genomic islands (comprising 41 kb of the complete plasmid). The first region possessed a 21 kb island (pMR68 co-coordinates: 59,285–71,020 and 1–9,472), which contained genes involved in mercurial resistance and mobility (Figure 1). The second region possessed a 20 kb island (pMR68 co-coordinates; 10,189–30,567), which contained plasmid transposable elements (Figure 1). A summary of the sequence data for pMR68, including the length and molecular mass of the predicted proteins and their sequence homology with known proteins, is shown in Additional file 2: Table S2. Genetic map of the P. strain K-62 plasmid, pMR68. The deduced coding regions are shown by open arrows indicating the direction of transcription. The circular positions are indicated at intervals of 20,000 bp. The gene clusters responsible for mercurial resistance, transposable elements, metabolizing enzymes, and hypothetical proteins are indicated by the black, gray, open and shaded arrows, respectively. The pMR68 plasmid contained three putative mercury-resistance (mer) gene clusters (Figure 1): Cluster 1) a potential mer operon, consisting of the merR-orf4-orf5-T1-P1-F-A-B1 genes (ORFs 3 and 6–10); Cluster 2) mercury transport genes, merT2-P2 (ORFs 62 and 63); and Cluster 3) an organomercurial lyase gene, merB2 (ORF 72) (Additional file 2: Table S2 and Figures 1 and 2). The potential mer operon within pMR68 was located between putative transposable elements, and flanked by genes encoding a transposase IS4 family protein (ORF 75) and a transposase IS5 family protein (ORF 11) (Additional file 2: Table S2). The incomplete mer operon (cluster 2) within pMR68 was also located between putative transposable elements, and flanked by genes encoding a transposase IS30 family protein (ORF 56) and a transposase IS116 family protein (ORF 68) (Additional file 2: Table S2). The DNA sequence showed the presence of putative promoters upstream of the merT1 genes within the complete mer operon of cluster 1 (Figure 2). Upstream of merR and upstream of merT1 were sequences containing potential −35 (ATCAGA) and −10 (GATTAT) and −35 (TTGCAC) and −10 (CATAAT) sequences, and a dyad symmetrical sequence (GCACCTGTAGCCGCTACAGGTTG), respectively, which could be interpreted as an operator/promoter (o/p) sequence (cluster 1, Figure 2). Organization of the mer operon of pMR68 and its homology with the corresponding mer genes identified in pMR68. merR, regulatory gene; merT and merF, mercury transport genes; merP, mercury binding gene; merA, mercuric reductase gene; merB, organomercurial lyase gene; orf, unknown open reading frame. ORF4 (encoding a hypothetical protein (HP)) and ORF5 (showing 63% identity to phosphoribosyl-AMP cyclohydrolase from Parvibaculum lavamentivorans DS-1) were located between MerR and MerT1. Two sets of merT, merP, and merB genes were found in pMR68, and the similarities between merT1 and merT2, merP1 and merP2, and merB1 and merB2 ranged from 27% to 69% at both the nucleic acid and amino acid levels (Figure 2). The sequence similarity between the pMR68 and pMR26 proteins (Kiyono et al. 1997;Kiyono and Pan-Hou 1999a) from strain K-62 or the well-known pDU1358 (Griffin et al. 1987) and Tn21 (Gilbert and Summers 1988;Liebert et al. 1999) proteins from Gram-negative bacteria was low (Table 2). To identify the physiological role played by the mer operons in pMR68 and pMR26 in E. coli, we constructed recombinant plasmids pMKY12 and pMRA114, which contained the merR-orf4-orf5-merT1-merP1-merF-merA-merB1 genes from pMR68 and the merR-merT-merP-merA-merG-merB1 genes from pMR26, respectively (Table 1). Bacteria containing pMKY12 showed greater resistance to Hg(II) than control cells carrying plasmid pUC118; the level of resistance was almost the same as that shown by cells containing pMRA114 (Figure 3A). Susceptibility to mercurials. E. coli cells carrying pUC118 (filled triangles), pMKY12 (filled circles), or pMRA114 (filled diamonds) were grown in liquid medium containing varying concentrations of HgCl2 (A) or C6H5HgOCOCH3 (B). Growth was estimated by measuring the turbidity at 600 nm. Data represent the mean ± S.D. of triplicate measurements from three independent experiments. *p < 0.05 vs. control. **p < 0.01 vs. control. ## p < 0.01 vs. pMRA114. We next examined the volatilization of mercury from Hg(II) and C6H5Hg(I) by cells containing a control vector (pUC118) or the pMKY12 or pMRA114 plasmids. As shown in Figure 4, cells carrying both pMKY12 and pMRA114 were able to volatilize mercury from both Hg(II) and C6H5Hg(I). 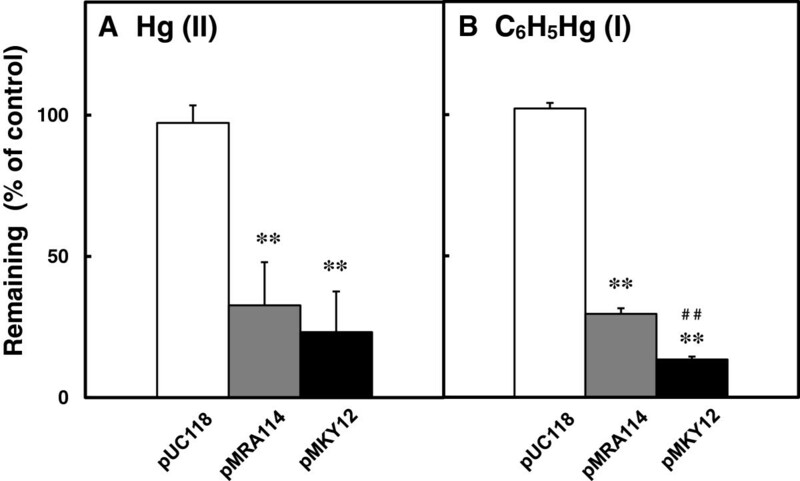 Volatilization of Hg(II) was similar between cells carrying pMKY12 or pMRA114; however, volatilization of C6H5Hg(I) was significantly higher in cells carrying pMKY12 than in those carrying pMRA114 (Figure 4B). A volatilization test indicated that the cells carrying pMKY12 were able to volatilize almost 90% of the total phenylmercury. Volatilization of mercury from Hg(II) and C 6 H 5 Hg(I). E. coli cells carrying pUC118 (empty bar), pMRA114 (shaded bar), or pMKY12 (black bar) were grown in liquid medium containing 50 μM HgCl2 (A) or 5 μM C6H5HgOCOCH3 (B). After incubation at 37°C for 16 h, the amount of mercury remaining in the medium was measured as described in “Materials and Methods”. Data represent the mean ± S.D. of triplicate measurements from three independent experiments. **p < 0.01 vs. control. ## p < 0.01 vs. pMRA114. The present study determined the complete nucleotide sequence of plasmid pMR68 (isolated from P. strain K-62). In addition, the mer genes in pMR68 and pMR26 were identified, sequenced, and cloned in E. coli. The pMR68 sequence contained 75 complete coding regions; however, we were not able to identify a predicted origin of replication (Additional file 2: Table S2 and Figure 1). Although most of the identified genes (44%) encoded mobile elements related to transfer functions, 12% encoded mercurial-resistance determinants, 16% encoded metabolism-related genes, and 28% encoded hypothetical proteins (HPs). 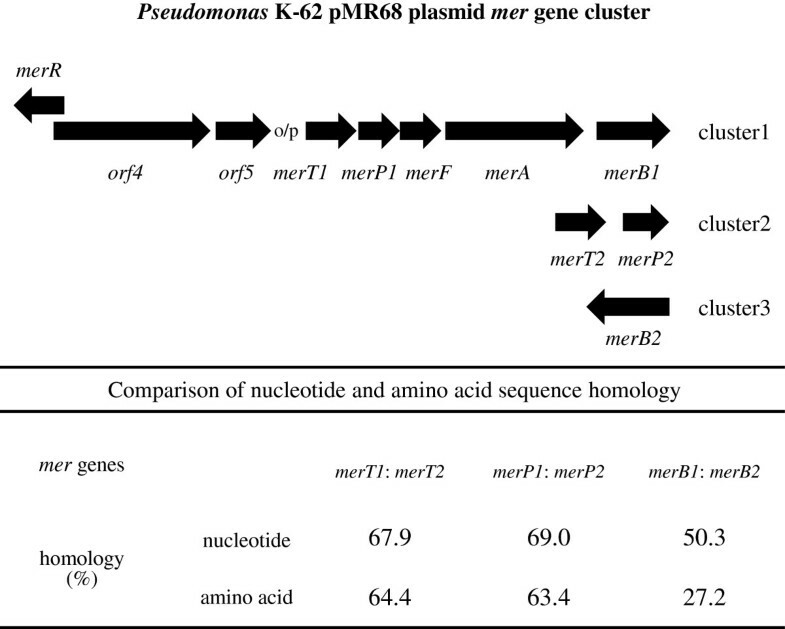 One of the three mer- gene clusters in pMR68 (merR-orf4-orf5-merT1-merP1-merF-merA-merB1) was identified as a potential mer operon, which confers bacterial resistance to both inorganic and organic mercury (Additional file 2: Table S2 and Figure 3). The number and order of the mer genes on this potential mer operon were different to those of merR1- o/p-T-P-A-G-B1 of pMR26 (which encodes resistance to both inorganic and organic mercury) and merR2- o/p-B2-D of pMR26 (which confers bacterial hypersensitivity to organomercury compounds) (Table 2 and Figures 1 and 2) (Kiyono et al. 1997;Kiyono and Pan-Hou 1999a;Kiyono et al. 1997). The deduced amino acid sequences for the proteins encoded by the mer genes in pMR68 were more similar (67–84%) to those of a putative mer operon in Methylobacterium extorquens AM1, which lacks the merB gene (Vuilleumier et al. 2009), than to those in pMR26 (21–47%) (Table 2). We identified potential −35 and −10 sequences and a dyad symmetrical sequence lying upstream of pMR68 merR and upstream of merT1, respectively; these sequences may represent putative promoters of the mer operon of cluster 1 in pMR68. The distance between the −35 and −10 positions within the putative pMR68 merR promoter was 19 bp. The spacing between the merR promoter and Tn21 in pMR26 was also 19 bp, which is essential for the “twist and bend” mechanism underlying transcriptional activation (Ansari et al. 1995;Kiyono et al. 1997;Kiyono and Pan-Hou 1999a). Taken together, these observations suggest that merT1-P1-F-A-B1 is regulated by both the merR gene and the mer operator. Volatilization of mercury from organomercurials is thought to result from the degradation of organic mercury by the organomercurial lyase encoded by merB, followed by the reduction of the resulting Hg2+ to volatile Hg0 by the mercuric reductase encoded by merA (Barkay et al. 2003;Silver and Phung le 2005). Cells carrying pMKY12 (containing merR-orf4-orf5-merT1-merP1-merF-merA-merB1 cloned from pMR68) and cells carrying pMRA114 (containing merR-merT-merP-merA-merG-merB1 cloned from plasmid pMR26) were more resistant to, and volatilized more, mercury from mercuric chloride and phenylmercuric acetate than the control cells (Figures 3 and 4). The present results, together with those of our previous study, suggest that the high resistance to phenylmercury shown by strain K-62 may be due to the following:  the functional organomercurial lyase enzymes encoded by pMR26 merB1 and merB2 (Kiyono et al. 1995b;Kiyono et al. 1997;Kiyono and Pan-Hou 1999a), and pMR68 merB1;  the two functional mercuric reductases encoded by pMR26 merA (Kiyono et al. 1995b;Kiyono and Pan-Hou 1999a) and pMR68 merA;  the multi-functional transporters encoded by pMR26 merT and merP (Kiyono et al. 1995a;Kiyono et al. 2000;Nagata et al. 2006;Uno et al. 1997), and by pMR68 merT1-merP1-merF; and  alterations in cellular permeability to phenylmercury mediated by pMR26 merG (Kiyono and Pan-Hou 1999b). Further analysis of orf4 and orf5 within pMR68 is currently on-going. In conclusion, sequence analysis of pMR68 showed that the plasmid contains novel genes that may provide Pseudomonas strains with the means to adapt to a wide variety of challenging environments, including exposure to heavy metals. Such resistance mechanisms are likely to be linked to the evolution of the bacterial hosts. The novel mer gene identified in pMR68 may help us to design new strategies aimed at the bioremediation of mercury-containing compounds present in the environment. We thank Miss M. Suzuki, Mr. M. Saito and Mr. I. Okuno for their technical assistance. This work was supported in part by a Grant-in-Aid for Young Scientists (B) (No. 24790128) to Y.S. and a Grant-in-Aid for Scientific Research (C) (No. 24510104) to M.K. from the Ministry of Education, Science and Culture, Japan.